Homeowners spend a lot of time and invest a considerable amount of money trying to create a space that is safe, practical, and enjoyable. Building a home that is not only livable but something special is not an easy task. Rest assured that copper vents enhance the exterior of any home, while also helping to circulate clean, quality air into your home. If you are unsure of which copper vents are right for your home, enlist the help of the professionals at FAMCO. As one of the largest manufacturers of air ventilation products in the Pacific Northwest, we can help you find the right copper vent that will add dimension and style to your home. Why are copper vents important to have in the home? There are certain rooms within the home that tend to experience moisture build-up, for example the attic, kitchen, bathroom (showers), and laundry room. Ventilation is key to keeping these rooms safe and clean, keeping unwanted pollution and debris away, throughout the entire year. Cutting corners on ventilation is not worth it. 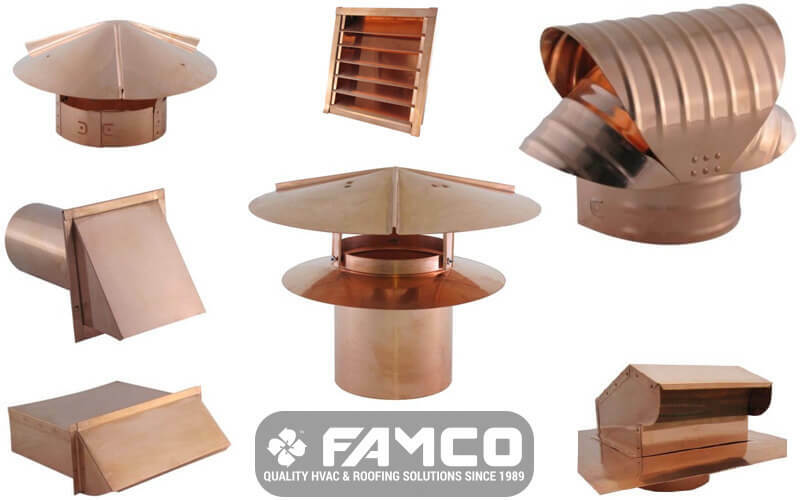 If you’re concerned about how copper roof vents will change the aesthetics of your home and decorating, you can result assured that FAMCO has a wide selection of vents that will enhance the exterior and interior of any home. It’s an investment you won’t have to regularly replace either. FAMCO’s expertly-made copper vents stand the test of time, especially compared with plastic of metal counterparts, holding up under the most extreme weather conditions without rusting or falling apart. Our secret is to use the finest, highest quality raw materials and follow proven manufacturing principles throughout the manufacturing process. Copper vents are available in an array of popular styles to allow you to select the vent that works best with the design of your home. If you have any hesitation at all, know that you FAMCO’s wall vents come with a 1-year warranty against product defects and workmanship. All FAMCO products are manufactured in the United States and are easy to install upon arrival.